When I was in Gensan, during the tour for outside Sockksargen bloggers who came for the Blogfest 2.0 one of our bountiful stop was in Sarangani Highlands. Why bountiful? Because we had our eat-all-you-can breakfast there! ahahahahaha I am not 100% sure whether the buffet breakfast is served regularly in the place but it when we went there. The breakfast was quite heavy (quite lang daw oh! hahaha), nothing extraordinary really, but my very sensitive tummy was very satisfied and happy. I like beef tapa much kasi hahahaha. By the way, don't be deceived with this plated in food, coz it went round 2 lols.. I was that hungry! 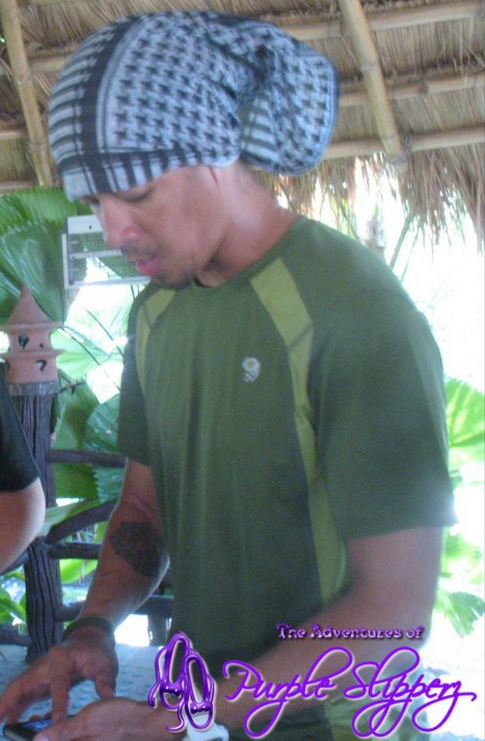 Over breakfast, in the other table we met the owner of Tribu (yes... tribu na tribu slipperz) and the guru of head wear. Who was actually there to try out paragliding in Sarangani Highlands, coz they're planning to promote it as one of the attractions and will eventually be offered to the adrenaline-rush lover public. Yup, such a lucky blogger to shook hands with a very humble and talented artist, entrepreneur and owner of Tribu. So after that sumptuous breakfast and a few chat and demo with the owner of Tribu (who's luckily an MSUAN and a Mindanaoan "mabuhay ang mga taga-mindanaooooooooooo mabuhay!!! awp " ahahaha), we had a chance to roam around the place,take pictures of it and enjoy the beauty of nature. It was peaceful. So here are a few which I think are a bit decent hehehe. That's choosiligancity and habagatcentral right there! when i saw this isle, I can only think of a wedding... hmmm walang kawala hahaha marry me or die ang show lols.. This is the restrooms. Discover what's behind this doors. Email: saranganihighlands@gmail.com or you may visit their Facebook Fanpage or Official Site.